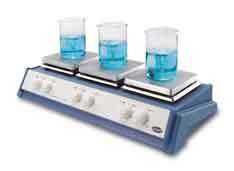 A space saving and economical unit with 3 independent heating/stirring positions in a footprint only 600 x 270mm. Easily accommodates 3 x 2 litre beakers. Unit only requires one power point and is ideal for quality control applications where multiple samples require simultaneous heating and stirring, under the same conditions. Supplied complete with 3 x 25mm PTFE coated stir bars.